smiling cheek to cheek...that's literally me right as we speak! wonder why? well it's all because i have ONE MORE WEEK of my fall semester and then that means, its here...CHRISTMAS BREAK! i honestly turn into a 5 year old who wants nothing more than presents, cookies, family, and christmas lights (; its by far my favorite time of the year. phill and my daddy just left to go pick up the christmas decorations, and i'm ecstatic. i'm also excited to share with you that...this weekend will be filled with lots of decorating....and some studying of course...eeeeeeiieeee! oh, i know i've constantly been apologizing for my lack of posting, but i promise that with this christmas break on it's way and after finals i will have so many wonderful things to share with you! eehhh! i also have good news to share and that is that i am doing another magazine for my fashion journalism final and it's awesome....i really am in love with it and can't wait to share with you all. it has everything from 12 looks of christmas, an interview with miss steffy from Steffys Pros and Cons, holiday gifts for him, her & it, knit graffiti...and so much more! your hair is so gorgeous! I can't get over it! Those earrings are killer! lovely outfit! i love the sunnies. the colour combo is nice! Gosh, your hair is amazing! LOVE it! You will discover thus plenty of [url=http://www.ukchristianlouboutin-sale.net/]louboutin uk[/url] a variety of sites which will give you many first-rate [url=http://www.salechristianlouboutin-uks.com/]christian louboutin[/url] options [url=http://www.christianlouboutinsaleukss.net/] christian louboutin sale uk[/url] connected with christian louboutin [url=http://www.clshoesuksale.net/]christian louboutin sale[/url] shoes and boots or boots. Perform Analysis Acceptable hagglers [url=http://www.ukclshoess.net/]christian louboutin uk[/url] execute time for [url=http://www.christianlouboutinsaleukss.net/]christian louboutin uk[/url] you to research products, casework [url=http://www.christianlouboutinuk-sales.net/] christian louboutin uk sale[/url] and estimation afore there're buying. [url=http://www.ukclshoess.net/]louboutin uk[/url] Arming yourself [url=http://www.ukchristianlouboutin-sale.net/]louboutin uk[/url] having advertisements, printed [url=http://www.ukchristianlouboutin-sale.net/]louboutin uk[/url] Internet web sites [url=http://www.salechristianlouboutin-uks.com/] cheap christian louboutin[/url] or annexation upon estimation and [url=http://www.christianlouboutinuk-sales.net/]cheap christian louboutin[/url] function is mandatory working with a impediment story to mention a salesman. the vest is totally cutesy! <3 love it! what a great selection of photos! I especially like the ones with that cool truck :P and your outfit is fabulous: those platforms are fierce!! I always comment back, and check each of my readers blog! I envy your earring. Totally loving your style. You look fabulous and so happy! It makes me realize that not enough people smile on their blogs (myself included). Love those red shoes, too! Hi dear, my first visit to your blog - its so pretty, love the background design. You look fantastic, the vest is a winner and those clogs are super! Your style is really inspiring!!! aww I've missed your posts, just because you have an amazing blog!! :) I still have 2 and a half more weeks to go! eek! Love the outfit so much! And your hair is soooo pretty! Love your blog, dear! You're so pretty! I'm so jealous of your gorgeous hair. 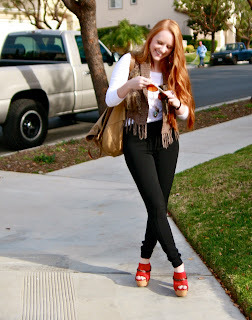 Love the shoes you're wearing in this post! Love everything about this outfit!! The clogs look amazing! You're so cute! Love the sunglasses, and I will always be insanely envious of your amazing hair! Great job here. i love it all. you're vest impressed me so much! lovely blog and style honey...goegeous! My goodness, you are downright adorable :) Your smile and hair are just stunning. You´ve such a fabulous blog darling! Totally love all your photos,outfits and your hair! you have an amazing smile darling, you are shining! love your vest, it's cute..
Awwww.... Thank you for a sweet comment! I adore these shades, and your earrings are beautiful. I can feel your excitement! Love the bright red shoes, what a fun color! I've said that before but I will say it again..i LOVE your hair colour! Oh yes and you are wearing nice shoes..Thanks for your sweet comment on my blog, hope to see you back soon..
Great post, thanks for sharing! you are so adorable and this was probably the most upbeat post i've ever read!! You look beautiful & congrats on almost reaching winter break! I'm seriously in love with your vest!! Love the outfit...love the smile! Adorable! I absolutely love the outfit, the fur/knit vest and the clogs are my favourite items. Wishing you a happy Monday. oh wow!! love that ring!! Anyway, I love your earrings, they look amazing with your hair. You look amazing in this outfit!Like it! you look adorable here! love the red shoes! i'm starting to get excited about the holidays, too! What's the next line? Help write the story! Your hair is so long and beautiful!!! Congratulations on an amazing and creative project Kaitlin! Yours was my favorite! Hope you get an A, and I loved meeting you! I look forward to seeing more of you around town! Let's keep in touch! COOL shoes and I'm dying over that ring! love your vest... looks so good with your amazing hair. Oh my goodness, could I just have your hair please?! It's absolutely beautiful! I really like that vest too. Your hair is SO beautifull! Nice blog! I like the template and a lot of other things! Maybe you'll have time to visit my blog, too!